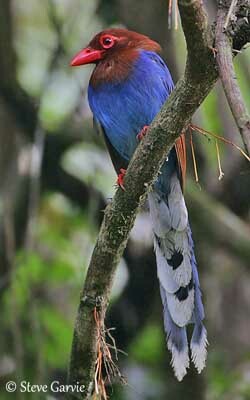 The Sri Lanka Blue Magpie is a Vulnerable species with restricted range where it can be fairly common locally. This species is threatened by the fragmentation of the rainforest habitat due to fires and deforestation. The increase of populations of Common Koel involves more parasitized nests. 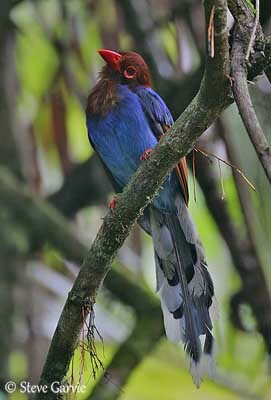 The Sri Lanka Blue Magpie or Ceylon Blue Magpie is endemic to Sri Lanka. This is a forest species, often seen in small groups. The adult has reddish-chestnut head, neck, throat and upper breast, and also primary and secondary flight feathers. Remainder of plumage is purplish-blue becoming paler, mostly sky blue, on rump and uppertail-coverts, and on belly and undertail-coverts. The long graduated tail is blue with white tips on the uppertail, whereas the undertail is paler, with larger white tips. The strong bill is coral red. The eyes are brown, surrounded by wide, bare red eye-ring. Legs and feet are red. The juvenile has duller plumage with washed greyish body. The bare parts are browner. Some variations such as high-pitched “creeik” and rising “whee-whee” are also uttered, usually, mainly high-pitched sounds. When they forage in groups, they give metallic chirps and squeaks. They also perform mimicry of other birds’ species. This magpie can be silent for long periods, but it is more vocal in the early evening and in the late afternoon. 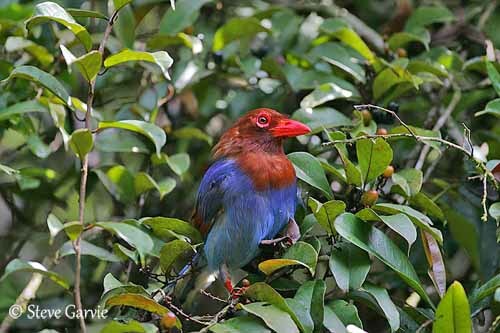 The Sri Lanka Blue Magpie occurs in undisturbed, primary forest, in tropical evergreen forest in hills and lowlands of wet zones. It also frequents the tea plantations’ edges and can be seen between 50 and 2100 metres of elevation. 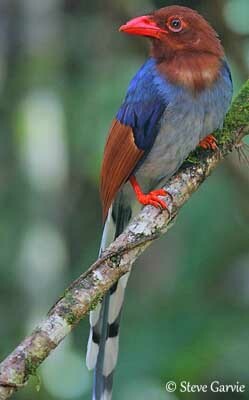 The Sri Lanka Blue Magpie is endemic to Sri Lanka, and is found mainly in SW where it is resident. 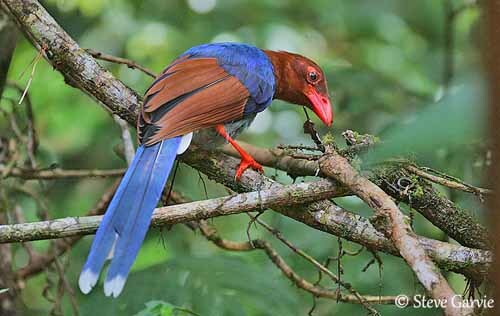 The Sri Lanka Blue Magpie is carnivorous as numerous Corvidae species. It feeds on invertebrates such as large insects and caterpillars, small lizards and tree frogs. It may consume some fruits and berries too. The hairy caterpillars are rubbed against a branch in order to remove the hairs before to swallow them. It is often seen is small family groups or single. They forage inside the canopy of the forest, at all levels, from the forest floor through the foliage and to the canopy. This bird may often swing upside-down at tip of some branches, and is also able to cling to a tree trunk upside-down, while searching for invertebrates into the bark crevices. Outside the breeding season, it may join mixed flocks of small birds. During the breeding season, small groups of birds can be seen near the nest. The Sri Lanka Blue Magpie is a co-operative breeder with some helpers, probably young from the previous year. These helpers often act as sentinels during the nesting period, being perched in strategic position and with a good view on the surroundings. They take part in most of the nesting duties and especially in territory defence by mobbing of predators. On the other hand, the Sri Lanka Blue Magpie is solitary breeder. With its long tail and its relatively short wings reaching only the tail base, the Sri Lanka Blue Magpie has more laboured flight than ravens, and performs more frequent wing-beats. The breeding season occurs from mid-January to late March. The nest is placed in tree, between 5 and 13 metres above the ground, usually near the top but inside the canopy of tall tree. In smaller tree, the nest is often placed on the outermost part of a branch. It is cup-shaped and made with sticks and twigs, and lined with finer materials such as rootlets and beard-like lichens. Both sexes build the nest. The female lays 3-5 eggs, usually 3 white eggs with dark spots. There is no information about the incubation and the fledging period, but the chicks are fed by both parents and helpers. The incubation is only by female. The Common Koel (Eudynamys scolopacea) may parasitize this species. The Sri Lanka Blue Magpie is carnivorous, feeding primarily on large insects and caterpillars, tree frogs and small lizards, and sometimes fruits and berries. It forages inside the canopy, often in small groups.